An experimental Merck vaccine is showing 100% effectiveness against the Ebola virus, according to results of a trial in Guinea published in The Lancet on Dec. 22. The vaccine was tested on people in West Africa from March 23, 2015 through Jan. 20, 2016, and has not been approved by the US Food and Drug Administration or any other agency, but is considered so effective than an emergency stockpile of 300,000 doses has already been created should there be another outbreak, the New York Times reported. According to The Lancet study, the vaccine, called rVSV-ZEBOV (Merck Sharp & Dohme) is a recombinant replication competent vesicular stomatitis virus-based vaccine that expresses a surface glycoprotein of the Zaire strain of Ebola virus. 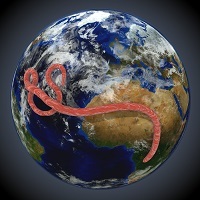 That is only one of five known Ebola strains, but it is among the most common. There are also some side effects, such as joint pain, and concerns that the protection may not last a long time, the Times said. In July Merck announced that it had received a "breakthrough therapy" designation for the vaccine candidate from the FDA and its European equivalent agency the EMA. The trial was called Ebola Ça Suffit! It was tested in Guineas and Sierra Leone. It was given in a single intramuscular dose administered in the deltoid muscle. The researchers vaccinated known contacts of people with newly diagnosed Ebola infection. Some were vaccinated immediately, some not for 21 days. In all, there were 2,151 people vaccinated. "No cases of Ebola virus disease occurred 10 days or more after randomisation," the researchers wrote. Other companies, including GlaxoSmithKline also have vaccines in development, and at the National Institute for Allergy and Infectious Disease, director Anthony Fauci told reporters it is still necessary to keep developing more vaccines with broader coverage. Funding was provided by the WHO, UK Wellcome Trust, Médecins Sans Frontières, Norwegian Ministry of Foreign Affairs (through the Research Council of Norway's GLOBVAC programme), and the Canadian Government (through the Public Health Agency of Canada, Canadian Institutes of Health Research, International Development Research Centre and Department of Foreign Affairs, Trade and Development).